At Broadway Roofing, our primary objective is to ensure top-quality roof repair service. We offer complimentary written estimates. We always start your roof repair estimate process with our industry leading 17-point roof inspection. No matter how your roof has become damaged, we will do all that we can to keep your home protected and to ensure that your project is completed on-time. Roofing problems are common in Dallas – Fort Worth and surrounding areas of North Texas. The most often reported problem is roof leaks. Strong storms with high winds and aging roofs are often the problem. A roof leak left unrepaired can cause further damage to the existing roof along with mold developing inside of the home. 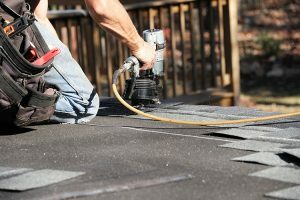 There are five things that are deemed mandatory roof repairs. Roof leaks: Leaks are not always easy to identify, which it is why it is important to be proactive in finding and repairing any roof leak that is suspected. Where you see a water leak in a ceiling is not usually where the leak is. An inspection and plan of action by a professional is crucial. Dark spots on the roof: Mold spots can occur on a typical composite roof if water has penetrated the different roof layers. If this is noticed, an inspection should be done to assess the reliability of the roof. Sometimes this is an easy repair, sometimes it is a symptom of a larger problem. A professional should make this determination. Blown-off shingles: Strong winds can blow away entire sections of vulnerable roofs. The roofing felt and sheathing may be damaged as well. A professional should inspect the roof to determine if a repair or a whole roof replacement is necessary. Hail damaged roof: Hail can cause damage to roofs, but not only the roof. Often skylights, gutters, and vent hoods are damaged by hail. All types of roofing are susceptible to hail damage. Even if a leak is not evident after a hail storm, the damaged the roof sustained could compromise the roof’s integrity in future weather events. Broadway Roofing will inspect your roof and repair any issues that are discovered. We offer emergency roof service as well for quick and efficient service after any unexpected event. At Broadway Roofing, we repair and install roofs tougher than most ordinary roofing services. Our roofing service starts with a 17-point inspection process that ensures that nothing is overlooked and your new or repaired roof will last longer, protecting your home and family for years to come. Contact Broadway Roofing for your roof repair needs. A prompt inspection and estimate will be provided.